On An Overgrown Path: New audience for classical music, or for Mahler's music? New audience for classical music, or for Mahler's music? My thesis that the premier league composers are not played often enough is supported by the 2014 BBC Proms season. Understandably, if regretably, there is a bias towards Richard Strauss. But, beyond the anniversary effect, there are eight performances of Mahler's music - seven symphonies and a chamber work - and not a single note of Haydn. Moreover, Haydn was also totally absent from the 2013 season, while, by contrast, Mahler's Second Symphony was performed in 2011 and 2013. It is unfair to blame outgoing Proms director Roger Wright for either the Mahler glut or the Haydn drought, and it is is unlikely the balance will change in the seasons created by his successor. (Incidentally, my money is on Tony "breaking down walls" Hall appointing Classic FM boss Stephen Miron to an expanded arts role in the BBC including Radio 3 and the Proms). But back to feast or famine concert programming; the love affair with big name orchestras is partly to blame - will there ever be a Proms season without the Berlin Philharmonic and the West-Eastern Divan Orchestra? As Proms apologist Ivan Hewett explains: "Often the inclusion of this or that concerto or soloist doesn’t have a special significance; it’s all to do with who happens to be on tour, and which piece is in the repertoire of this or that orchestra". Which is perfectly true; but there is a deeper problem which was highlighted by an Overgrown Path reader back in 2011: "One of the issues we face today is the ever-increasing division of classical performances into small, ghetto-like compartments [...] even performances of Mozart, Haydn and even early Beethoven, which used to be a staple of most symphony orchestras' concert seasons, are becoming rarities". Fortunately Mozart and Beethoven are better represented in the 2014 Proms than Haydn, and the wise Bernard Haitink even prefaces Mahler with Schubert. 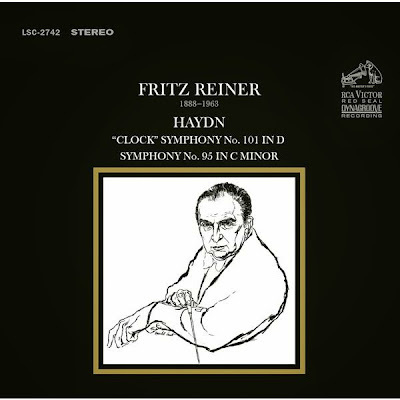 But this Mahler-centric programming - and it is not just the Proms - raises some important questions.I cut my teeth on Fritz Reiner's Haydn symphonies on LP, and Reiner with his Chicago orchestra could deliver both superlative Haydn and superlative Mahler. The current Mahler glut may well attract a new audience. But how many of them even know that Haydn exists? Do we want a new audience for classical music, or a new audience for Mahler's music? Which, moving away from the specific, raises the question of do the arts need wide or deep audiences? These days, works like Haydn and Mozart are played by artists who have learned them not from the Reiners but more from baroque musicians. A hall like the Royal Albert Hall is very big and accomodates better Mahler-sized works than chamber orchestras. I remember Rattle conducting Rameau's Les Boréades in 1999 and leaving the hall because I could not hear the music. Should not the problem be to find a more suitable place in London during the Summer to play these types of work ?